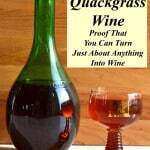 Quackgrass Wine - Ferment Your Weeds! 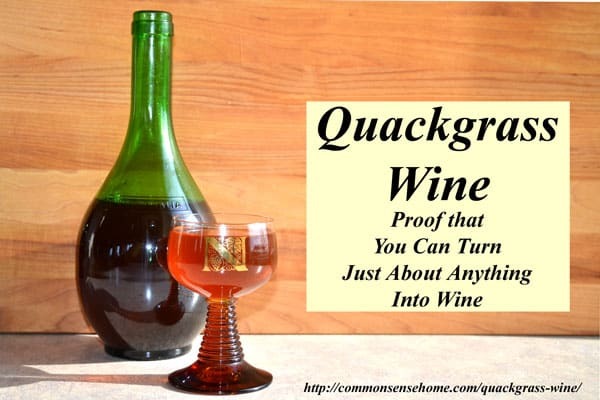 You are here: Home / Recipes / Quackgrass Wine – Ferment Your Weeds! 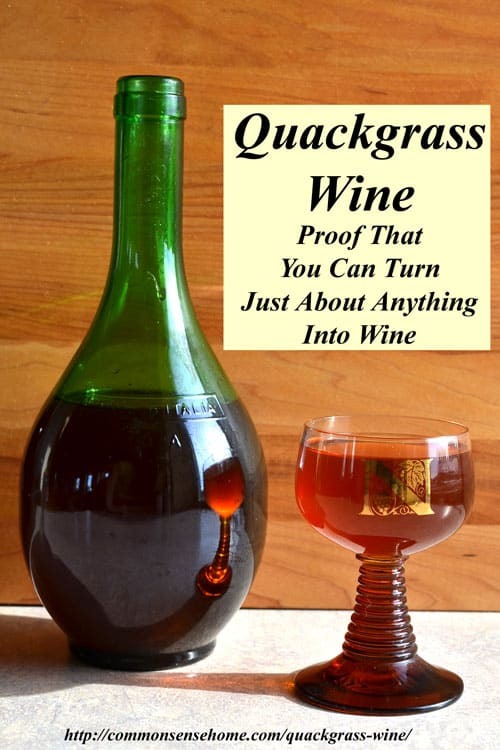 Since we needed to clear the quackgrass anyway, I thought it was a perfect time to conduct a little experiment with quackgrass wine. As we were clearing and pulling, everyone yanked the tops off the grass and tossed the roots into a large tub. My goal was to get around 4 pounds of roots, since I was adapting a recipe for parsnip wine that started with that amount of product. I would like to go on record as saying that 4 pounds of quackgrass roots is a stunning amount of quackgrass. After washing and cleaning and trimming and chopping, I had my 8 quart stock pot overflowing at 2 pounds, so I called it “good enough”. 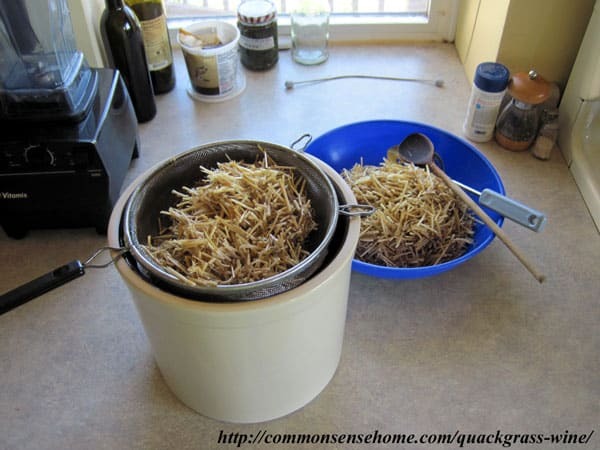 Side note – I tried dehydrating the leftover roots to grind them into flour. The result was tough, stringy inedible root bits – as one would expect from dried grass roots. Maybe they need to be mashed before drying? If anyone who has actually made quackgrass flour, I'd love to hear from you. Cut the scrubbed, trimmed quackgrass roots into roughly one inch long sections. In a large stockpot, boil the roots gently with 4 pints of water and 1 ounce of citric acid until they are tender. Meanwhile, chop the raisins and place them in your 1 gallon fermenting crock or pail. Strain the quackgrass root liquid and pour over the raisins. Cool completely. Add the nutrient tablet and wine yeast. Stir well. Cover and allow to ferment for 5 days, stirring each day. Heat 1 1/2 pints of water, add 3 pounds of sugar. Mix until all sugar is dissolved. Add citric acid. Stir until dissolved. Let cool. Strain quackgrass root/raisin ferment. Mix quackgrass water and sugar water. 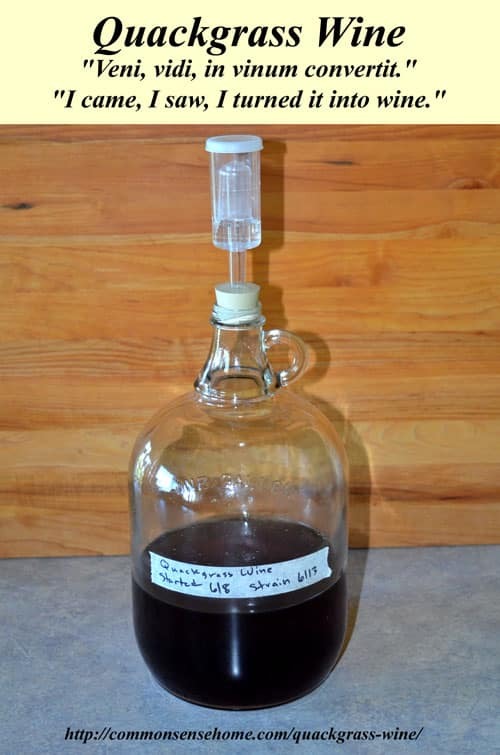 Pour mixture into 1 gallon fermentation vessel, fit with airlock. Allow to ferment 6 months, racking at 3 months if desired. Bottle and ferment for at least a year total. This made about 1/2 gallon of wine (2 bottles). The flavor reminds me of plum wine – sweet, a little earthy, but with some nice fruity notes. You could easily double it, if you had the patience to clean up enough roots. I'm a cottage wine maker, not a serious vintner – the simpler the recipe, the better. I mixed this up last spring, and it sat abandoned on a corner of my kitchen counter under a towel until this summer. I never racked it except when I bottled it. It still tastes pretty good and has enough kick to warm you up on a chilly evening. A rich, sweet wine with a hint of fruitiness. 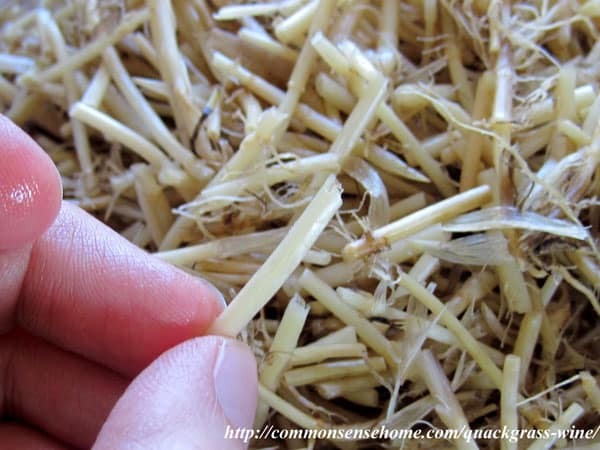 Cut the scrubbed, trimmed quackgrass roots into roughly one inch long sections. In a large stockpot, boil the roots gently with 4 points of water and 1 ounce of citric acid until they are tender.